The Creative Studio: You're the best! Happy Monday all!! Spring is only a few days away and what better way to usher it in than a "Think Spring" challenge going on over at Inky Paws this week. 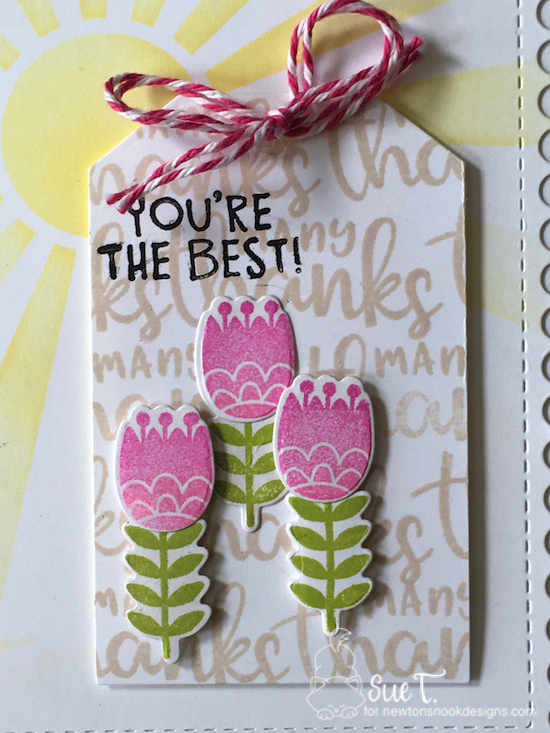 My card today was inspired by all the signs of spring that surround me. For me, spring is about the sun warming us and the flowers are beginning to bloom. During my daily walk I see signs of spring everywhere. The daffodils and tulips are pushing up and will be blooming before you know it. The crocuses are blooming. I used "Thankful Thoughts", "Cottage Garden", the "Sunscape" stencil, "Frame Works die and Fancy Edges tag set. 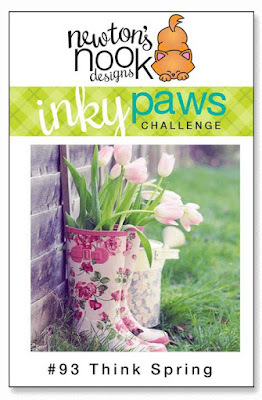 Head on over to Inky Paws and join in this springy theme challenge. We will chose a RANDOM entry to win a $20.00 Newton's Nook store gift certificate. Our favorite entries from each challenge will be highlighted the following Monday, so all entries have a chance to be featured on the blog. The deadline to enter today's challenge is Friday, March 22, 2019 at MN CST. The winners will be announced on the following Monday at Inky Paws. What a fun card! I love the sun in the background and the way you used the tag and covered it with words! The flowers give the perfect finishing touch! So awesome! 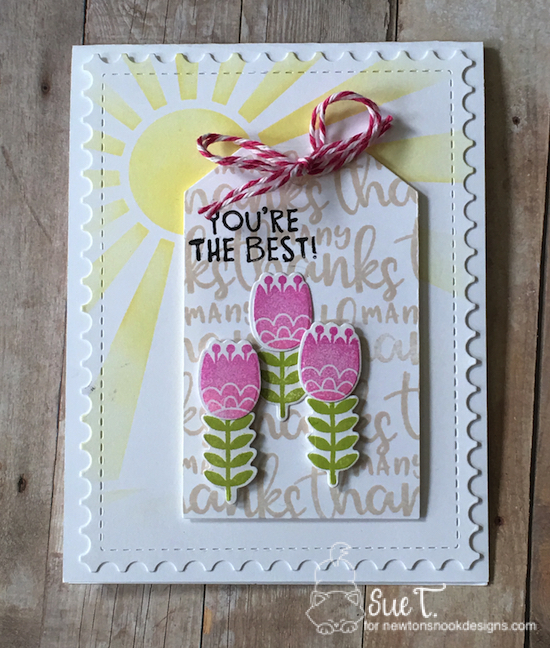 Your tulip tag is adorable, and the sunshine background is sure to bring smiles. 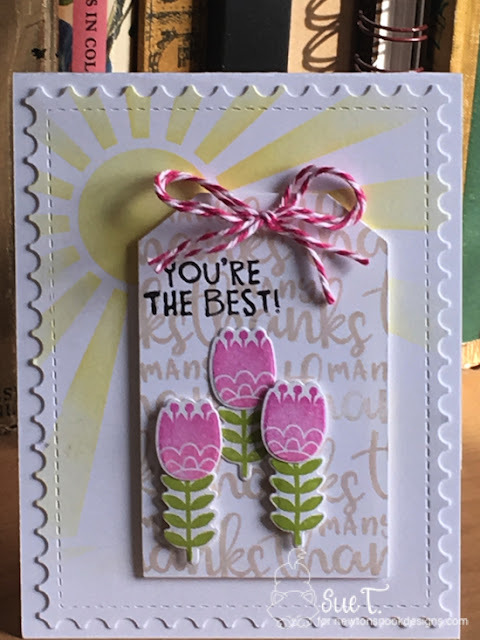 Lovely spring card. That's why it's a challenge!